We will post photo data captured while on an investigation on this page. This is data that we feel is of a paranormal nature. Please note that we have been granted permission to share this information on our website. Disclaimer: All content posted as data on this website should be considered as possible data only. The Paranormal field, as well as the techniques and equipment used by us, is always changing. Therefore, what we may consider paranormal today, may be found to be normal tomorrow. Note: Due to many factors we will no longer be adding new data from cases onto the website. These photos are actually still frames from our IR camera that was rolling on the 2nd floor of the mansion. We have studied these stills and just can not make out what they could be. Please note that these images appeared in only one frame of the camera filming. What do you think they are? We would love to hear your thoughts on them. This photo was taken in one of the client bedrooms using a digital camera on a slower speed and having a black light on with no flash. The purple light string is the IR camera light. What do you think it is? 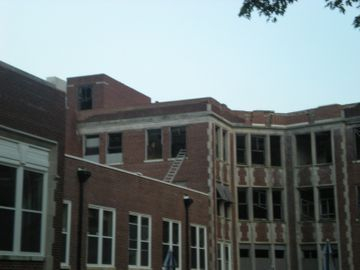 This photo was taken when the team was taking a pre-investigation tour of the location. This is the front of the building. Take a look at the window on the 4th floor. There was no one on the 4th floor at the time. This photo is on loan to TnT Paranormal from a friend close to the team.